SKAGIT COUNTY — New England in autumn has “leaf peeping.” Western Washington in spring has, uh, flower flirting. We have a love affair with tulips, farmed by the hundreds of thousands in the Skagit River Valley between Mount Vernon and La Conner. When fields bloom, usually from late March to late April, zephyr-rippled seas of red, yellow and pink draw throngs of camera-toting tourists. 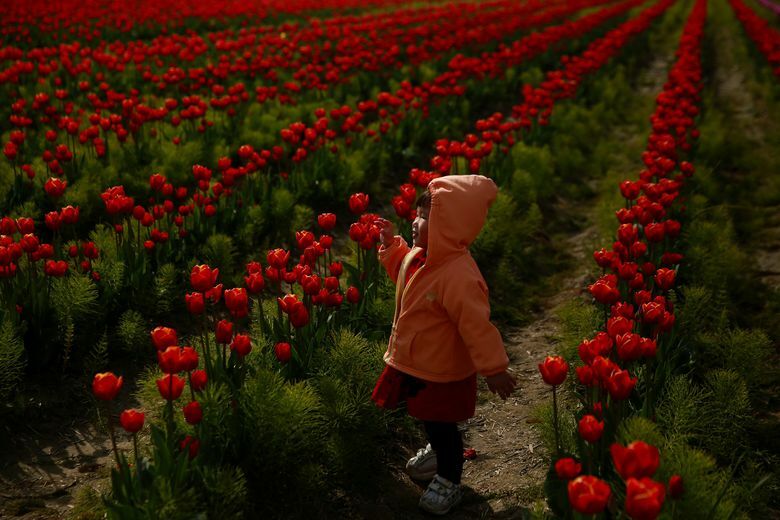 Their migration spawned the annual Skagit Valley Tulip Festival, running the entire month of April. But this broad valley created by one of the West’s great rivers is also a prime destination for cyclists and other fresh-air devotees. My recommendation: Play hooky, find a sunny spring weekday when tourist traffic is low, throw bikes on your rack or boots in the trunk and go get your fill of flowers. The Skagit Valley is roughly 60 miles north of Seattle. From Interstate 5, take Exit 221 to Conway/La Conner. Go west to the roundabout, take the second right and follow signs to La Conner. Tulip Country Bike Tours offers rental bikes, gear and tulip-route maps, $40 adults, $10 for younger than 16. Weekend guided tours for groups of 12 or more, by reservation; 360-424-7461 or countrycycling.com. The annual Tulip Pedal group ride, with 20-, 40- and 60-mile routes, is April 21, from La Conner. $35-$40; age 14 and younger free. 360-661-7417 or safekidsnorthwest.org. Beat the crowds: Head to the Skagit Valley in March to see fields of yellow daffodils, which blossom earlier than tulips. The town of La Conner has capitalized on that with its March Daffodil Festival, including gardening workshops, a photo contest and more. For a fun cycling trip along flat, two-lane roads, start from La Conner and loop through the valley past at least half a dozen tulip fields. 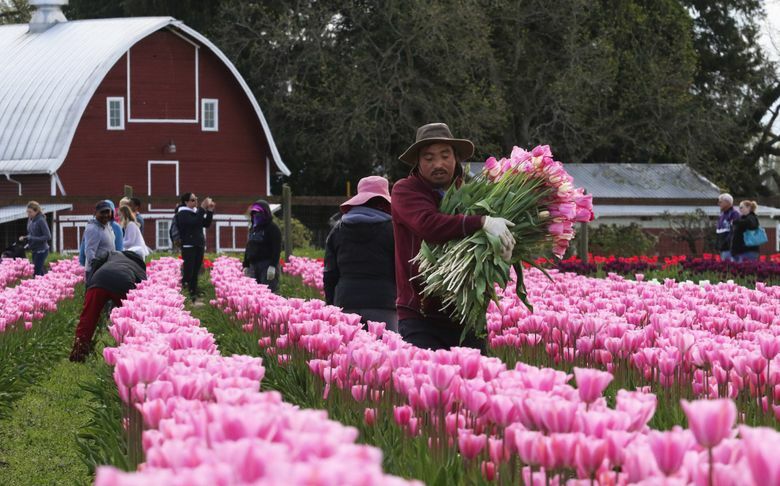 Most are farmed by family-owned Washington Bulb Co. (aka RoozenGaarde), the nation’s largest tulip-bulb grower, which also ships more than 70 million cut flowers across the United States each year. La Conner has a public parking lot at South Third and Moore streets, behind Town Hall. 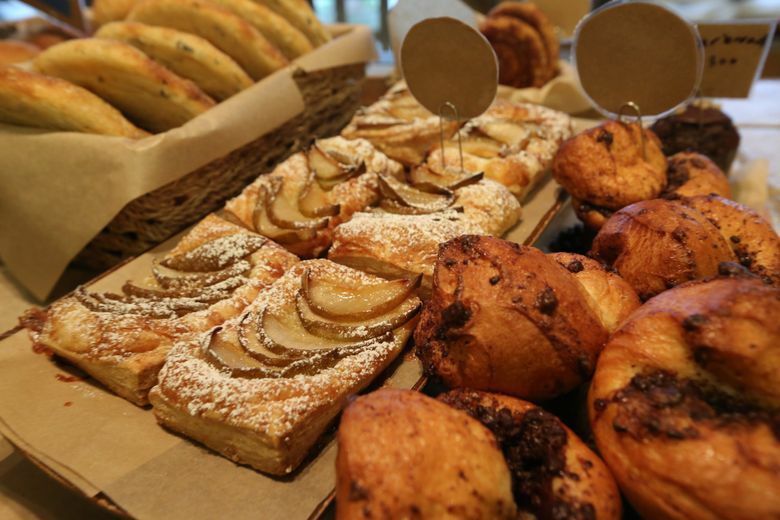 Go early and try the Calico Cupboard Cafe for a hearty breakfast, or carbo-load on cinnamon rolls (traditional, apple, raspberry, caramel nut, or — cue the Pavlovian saliva — maple bacon). It’s at 720 First St., calicocupboardcafe.com. 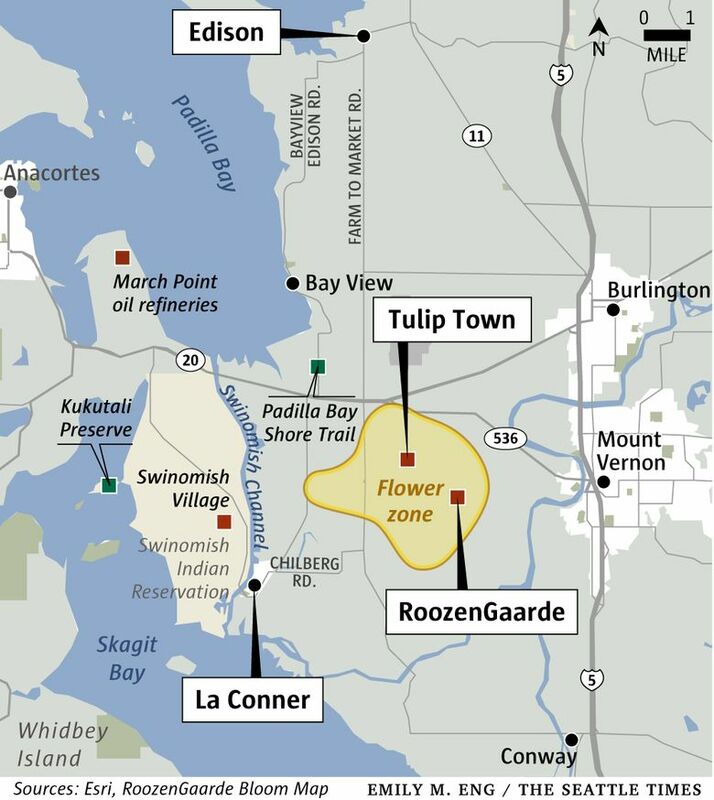 To plan your route, pick up a Skagit Valley Tulip Festival brochure (with map) at La Conner’s Visitor Information Center, 511 Morris St., or download it online at tulipfestival.org/brochure. Tip: Quietest roads on the flower routes are Calhoun, Beaver Marsh, Bradshaw and Young roads. To find fields with color, check the bloom map at tulips.com/bloommap. At peak season, you can see plenty of field flowers without paying to visit the gardens, though the gardens assure some blooms and Tulip Town offers a “trolley” ride into a tulip field ($1-$2), whereas venturing into fields is mostly prohibited elsewhere. Extend your two-wheel adventure with a little up-and-down exercise along the way: Continue north to the tiny yesteryear burg of Edison, home of galleries, fringe-culture dining, and what’s, for my money, North America’s best bakery, Breadfarm. From La Conner-Whitney Road, cross Highway 20 to Bayview Edison Road and just keep going until you intersect with (and continue a short distance farther north on) Farm to Market Road, which has North America’s best road name and is also a good return route. • Kukutali Preserve, an out-of-the-way bit of delight jointly managed by the Swinomish Tribe and Washington State Parks. It includes Kiket Island, connected to mainland (Fidalgo Island, actually) by a strip of land just wide enough for a gravel drive, limited to hikers these days. 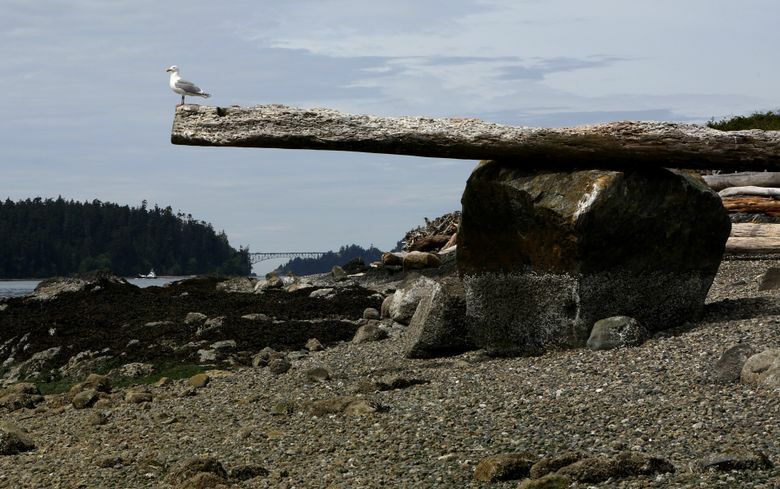 You’ll find old-growth trees, plus driftwood-strewn beaches with up-close views of Hope and Skagit islands, Similk Bay and, from the far point (2.2 miles round-trip), the inland side of Deception Pass Bridge. • Padilla Bay Shore Trail is a 2¼-mile dike-top path for pedestrians and cyclists that explores what is considered the most diverse, least-disturbed and most biologically productive of all major estuaries feeding the Puget Sound basin — despite the proximity of Anacortes oil refineries. Padilla and nearby Samish Bay support one of the largest known wintering populations of peregrine falcons in North America. Follow your explorations with a stop at the nearby Breazeale Interpretive Center of the Padilla Bay National Estuarine Research Reserve, whose research spotlights the shallow bay’s 8,000+-acre eelgrass meadow, the second largest on North America’s Pacific Coast. It’s treasured as a nursery for juvenile salmon, crab and herring (10441 Bayview Edison Road; free).